Amazon BKK 2 is a purpose built predator fishery in Thailand near Bangkok which has been heavily stocked in the last few years with a wide selection of Amazon and native predatory species and is devoted entirely to lure fishing and fly fishing. 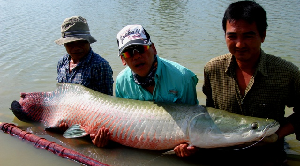 Amazon BKK 2 is located a pleasant 1.5 hour journey from Bangkok City Centre in the neighbouring province of Nakom Pathom and offers reasonably priced quality lure fishing and fly fishing for Arapaima and other Amazon predator species. The lake covers an area of over 12 rai with variable depths ranging between 3-6 metres. The Amazon lake has no underwater snags or obstructions and has wide open banks making it perfectly suited to fly fishing and lure fishing techniques. The lake has been heavily stocked with various predator species most notably the awesome Arapaima which has been introduced into the lake with lengths upto 2 metres and estimated weights to 150kgs. The venue in recent stockings has had over 200 hundred individual Arapaima introduced to its depths in addition to hundreds more other Amazon predator species such as Sorubim, Redtail Catfish, Arapaima, Arowana, Alligator Gar and various other predatory species. The lake is lined with several well appointed salas which offer shade for visiting anglers and is settled amongst a back drop of palm trees and other tropical flora and fauna. A wooden bridge also stretches across the lake which is in a perfect position to reach some of the more wary fish that reside in the centre of the pond. Toilets and shower facilities are located onsite in addition a restaurant serving a basic menu of delicious and authentic Thai cuisine is located a short distance from the lake and is able to arrange delivery to the lakeside. 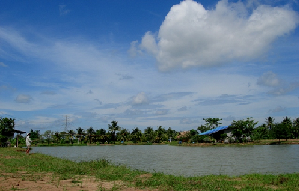 This venue also responds well to fly techniques and is a perfect choice for fly fishermen and lure anglers alike, giving them the opportunity to fish for several Amazon monster fish species a short distance from Bangkok city centre. Our trips to this exciting predator lake can be fished on a daily or multi day basis or incorporated into one of our weekly fishing holidays designed to meet the anglers specific angling requirements. For more information about Amazon BKK 2 or any of our other fishing holidays and venues contact us using the button below.